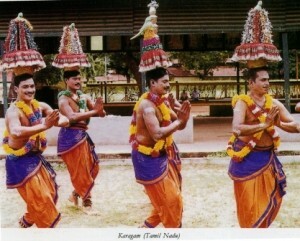 The Kavadi is the trance dance of Tamil Nadu. Kavadi is a wooden shaft with two triangular conical bamboo frames tied to both the ends. The pilgrims to the temple of Lord Muruga at Palani carry these Kavadis on their shoulder putting milk or scented water pots in the bamboo frames. They go in a procession, all the way singing and dancing to the music provided by Nadaswaram, the reeled wind instrument, and Thavil, the drum. A legend is associated with this pilgrimage. According to the legend, Idumban was a giant. He uprooted two hillocks and tied them to the two ends of a pole. He then lifted and slung it from his shoulder. Appreciating the great prowess of the giant, Lord Muruga (son of Shiva, also known as Subramanya, and in North India as Kartik) appointed him as chief assistant. Therefore, Idumban is first worshiped before the worship of Lord Muruga. The Kavadis represent Idumban’s sling with two hillocks. Hundreds of pilgrims carrying these Kavadis go on pilgrimage to the Lord Muruga temple. The pilgrimage procession stops when one or more are seen dancing in a slower tempo. The pilgrim dances for some time shifting the Kavadi skillfully from one shoulder to another The tempo rises and when the dancers fall into a trance they put the Kavadis on ground and allow themselves to be tortured. It is believed that those who are in trance have been possessed by evil spirits. They are tortured for the purification of their bodies. 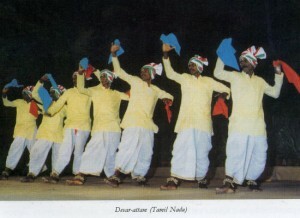 The Devar-attam is prevalent in Madurai district of Tamil Nadu. It is professionally conducted by a group of performing artist belonging to Kampalattu Nayakkar community. It is danced by men only wearing white costume. The headgear is also white from which dangles a colored bead. Seven or nine or eleven dancers are required to perform this dance on the occasion of a marriage ceremony. Specific songs are sung to the accompaniment of the drum music provided by Urumi. At times a long flute is also played. Another fascinating dance tradition of the South, especially of Tamil Nadu, is Karagam (pronounced as Kardgam). In this dance also a pitcher is used as a ritual object and the dance is accompanied by a procession. In fact, throughout India in many a ritual and folk dances pitcher is used. It is because in pauranic (old) literature, especially in Bhagavat Puran, the human body is likened to an earthen pitcher since both are fragile. The water with which the pitcher is filled symbolizes life. In many forms of pooja (worship) a mangal kalash (auspicious pitcher) is sanctified at the beginning of the worship. This ritual symbolizes the ritualisation of the body of the worshipper. In Karagam, the main dancer balances on his head a pitcher filled with uncooked rice and water. Here the rice symbolizes food that sustains life and therefore sacred. The pitcher is mounted by a conical bamboo frame decorated with flowers. The dance begins from a place in the village which is considered auspicious. A procession follows the dancers. They go to the temple of Mariamman, the goddess of health and rain. She is the protector from the dreaded small pox and cholera. It is traditionally performed in August. The dance has interesting elements of acrobatics. The orchestra that accompanies the dance is called Niyandi Melam. It consists of Thavil, the drum, Nadaswaram, reeled wind instrument, Muni, Udukkai, Pambai, various types of drums etc. Earlier only male dancers were performing this dance. Nowadays female dancers also participate. In many parts of the country dummy horse dance is performed. All the dummy horse dances, however, have elements of theatre and therefore quite entertaining. Dummy horse dance, irrespective of the region of its prevalence, is based on the same principle. Invariably the dummy horse is improvised with bamboo and cloth. The head of the horse is made with papier-mâché. A tail is also attached at the other end. The body is hollow, into which the dancer enters, as if into a cockpit. The dummy horse has no legs. When the dummy horse is lifted by the dancer and is slung from both the shoulder, it appears as if the dancer is riding a horse. The body of the dummy horse is near the waist of the dancer whose feet can be seen by the audience. The dancer dances to the beats of the accompanying music, style of which changes according to the place of its prevalence. The music draws heavily upon the folk music of the region. Singing and percussion music usually accompany the dance.